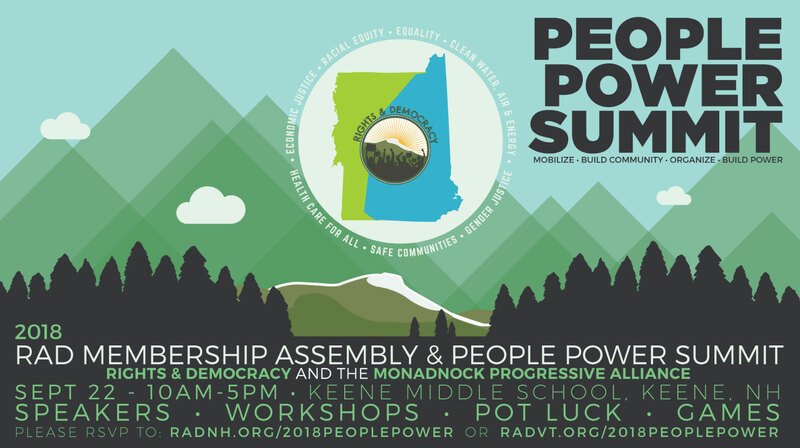 Join Rights & Democracy (RAD) and the Monadnock Progressive Alliance (MPA) for RAD’s Annual Membership Assembly and MPA’s People Power Summit. We’re planing a daylong event featuring special guest speakers, workshops, community building, and FUN. This is RAD’s annual opportunity for members to vote on our c4 Board members and help plan our work for the coming year & building towards 2020! Stay tuned for more details about special guest speakers and our Movement Builder Awards! If you would like to attend, but have childcare, interpretation, or other accessibility needs please contact isaac@radnh.org at least 5 business days in advance of the event.